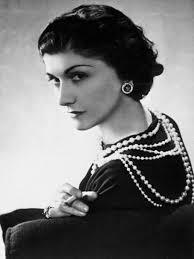 Coco Chanel said, ” A woman who cuts her hair is about to change her life.” Well, I have a new ‘do, and, I’m about to take a leap of faith. I am leaving my teaching career to pursue writing full time. I’m scared to death I’m doing something stupid, but it won’t be the first time. Life is all about figuring out who we are and what we are meant to do. I tell my students all the time to seize their opportunities and not be afraid, but it’s a whole other kind of scary when I am following that advice. With that said, I have noticed signs everywhere that God is telling me to take the plunge, but until now I’ve been too scared to trust Him and my own instinct that I’m doing the right thing. Writing is my calling. Three years ago I left a teaching job I hated (this was one of the first signs) and couldn’t find another before the school year began. Each day that school year I rose early to see my husband off to work. After I worked out and showered, I “dressed for work.” I fixed my hair, wore makeup, and put on nice clothes, then settled in to write for the rest of the morning and often late into the afternoon. Each day after no more words would come, I set my goals for the following day. Sometimes I planned to write particular scenes, sometimes I furthered my research and wrote only minimally, but I wrote and wrote and wrote. I finished the first draft of my novel that year. I was happy. I was content. What I loved most was finding the zone, the place where my muse was in full control. Instead of sitting in my desk chair I was inhabiting 1869 Charleston with my characters. In fact, I became those characters. They lived through me. Haddon Hall is a figment of my imagination but is as real as the computer I type on. The buttermilk biscuits in the kitchen house drip with freshly churned butter, and the grits are creamier than any I can purchase here in Wisconsin. I was in another place, another time, transcribing events and emotions that already existed in another realm. Time passed more slowly there too. Often I discovered three hours had passed when I felt only a matter of minutes had slipped by. I miss that place and that occupation. I was not myself then. But I was more myself than at any other time I can remember. Earlier in the year when I was struggling with this difficult decision, I turned to Facebook to ask my friends what they do for a living and what they like about their jobs. In a last ditch effort not to change, I think I was searching for alternatives to leaving. Many people offered me encouragement, prayers and guidance, but one response resonated with me. Tom Poland, a fellow UGA graduate and wonderful author, said, “As James Dickey, a tremendous writer, once told me, ‘Life is too short to give others your creative essence. '” That is what I do here at school each day. I spend my creative energy in giving to others, in teaching them how to read critically, how to write clearly and passionately, how to advocate for themselves and question accepted ways of thinking. It’s hard work, which leaves me mentally drained, but it’s rewarding work. If I’m honest, I think I had made the decision to leave teaching before I ever arrived at my job here at SPASH. After I had a taste of what the writing life was like, I never wanted anything else. Writing fills me up like nothing else ever has. I will miss my students. I will miss seeing the light of understanding fill their eyes. I will miss their stories, their sense of humor, their candid criticism, their guarded eyes at the beginning of the year turn to warm acceptance of me at the end. I’ll miss their unbridled physicality, their blue hair and tattoos, their gender-bending costumes for dodgeball games, their crazy and all too suggestive dancing, their youth and exuberance. I’ll miss it all! But I won’t forget. Writers never forget anything. Somewhere along the way, one girl’s smile, a boy’s clever joke, another’s moodiness, still another’s inquisitive nature will flesh out a character in one of my books. You see, writers don’t just live in the world; they see the world, in the words of Vladimir Nabokov, ” as the potentiality of fiction.” No experience ever goes to waste. I have not wasted my time teaching either. I don’t think I was ready years ago to become a writer. I hadn’t learned enough about myself or about the craft of writing to make the leap. In fact, I probably still haven’t, but I know there is no other way to learn the craft than by reading and writing a lot. Teaching doesn’t allow me enough of that. I’ve also learned far more about myself, about human nature, about creativity, about writing, and about driving snow-covered winter roads in Wisconsin than I ever thought possible. 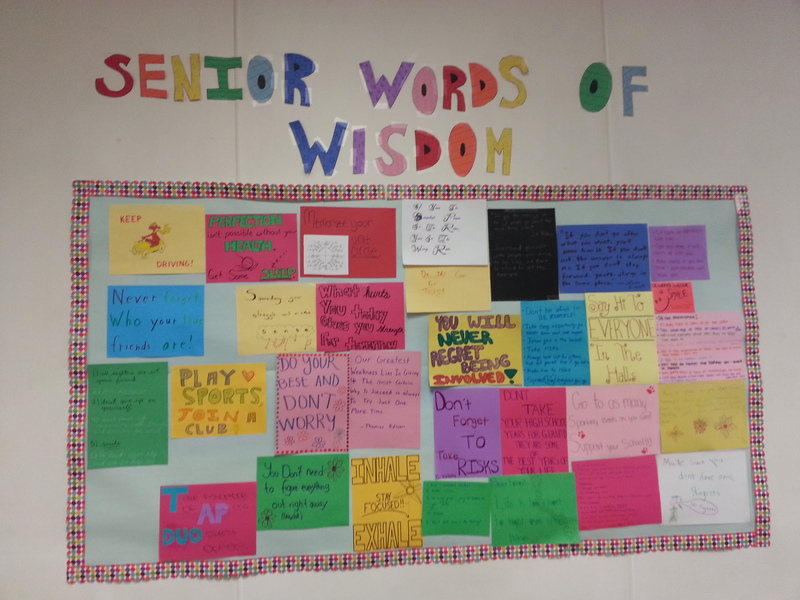 On the last days of class this year with my seniors, I asked them to channel their inner kindergartner and make a words of wisdom bulletin board for me. Their words were intended for the sophomores, but I was surprised by how much they spoke directly to me. They wrote, “Don’t forget to take risks; Take every opportunity. You never know what could happen; If you don’t go after what you want, you’ll never have it; Make sure you don’t have any regrets. Remember those signs I was talking about? I can read them now and plan to follow them. I find myself now sitting in my classroom on the last day of finals typing this up. I have only one day left as a teacher, but I don’t feel a sense of loss. I feel complete, as though one part of my life has ended well and another exciting opportunity is about to begin. I’m giddy with anticipation over what the next chapter of my life will bring. In the past I’ve had moments when I felt things “in my bones” so to speak. I feel in my bones that leaving teaching to become a writer is the right thing to do at the right time in my life. Thanks for the good luck wishes! I hope you’ll come to the realization that your students are always with you, no matter where life takes you. Teaching connects us to the lives of wonderful kids. No matter what we do, we will always be teachers. 🙂 I wish you an exciting second chapter of life! Let me know how it goes!!! Congratulations, Shannon! It’s a wonderful decision. This quote, ‘Life is too short to give others your creative essence.’ totally spoke to me. As a “professional volunteer” I know it’s time to take my time back. My time, my talent, my creativity. Mine, mine, mine, lol. Use it as I see fit and return it to the masses MY way. There are no failures here, only new successes. Shannon … I had no idea that my words resonated with you. I am with you and supporting you all the way. I’ll do anything to help you, my fellow writer and Georgian. More than you know, Tom! Thanks for the inspiration!